You have little control over the speed your employees create new ideas or solve problems. You can encourage or command individuals to work faster, however, when you are dealing with tasks that go beyond the mechanical or physical—those that involve knowledge work—the focus has to be on implementing processes and fostering an environment that enables faster group and individual learning. 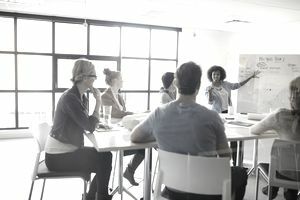 While you might feel compelled to cheerlead or even demand that people move faster, moral suasion or command approaches are significantly less effective than building an environment where people do their best work at their optimal pace. For better or worse, we are all wired to process information and generate output in our own way and on our terms and timetables. Effective managers understand this reality and adapt their styles accordingly to promote individual and team high performance. Our fast-paced world places a premium on speed. We strive in our organizations to respond quickly to customer concerns and to move faster than our competitors. The pace of change in technology demands a corresponding response from our organizations or we risk rapid obsolescence. Unfortunately, too many managers strive to respond to these demands as if they were setting the pace on a rowing team calling for everyone to row faster in unison. While this might work up to a point on a rowing team, it is mostly ineffective in the workplace. Consider two very different vocations: software development and sales. You might try and compel your software developers to code faster or badger your sales representatives to close deals faster. However, these commands ignore both the natural limits to creativity and the realities of the respective vocations. Writing software is a rigorous creative activity where each command has implications and often, unintended consequences for other commands or responses. Software development is comparable in many cases to simultaneously create and solving a jigsaw puzzle. The cry to create faster will both fall on deaf ears and likely rankle and slow down the target audience. In a sales situation, closing the deal requires the ultimate participation of multiple parties, including the buyer, frequently attorneys and the buyer’s financial authorities. Cajoling your representatives into closing deals faster is akin to asking the software developer to create faster. Other knowledge-work roles share these natural and vocational limits to speed. Instead of attempting to mandate faster performance, smart managers solve the need for a speed challenge by focusing instead on process and environmental improvements. In recent years, concepts including fast or lean start-up and agile project approaches have transformed the entrepreneurial and innovation worlds enabling new business launches and new product development activities to move further faster. Both lean start-up and agile methods rely on streamlined processes that emphasize fast, iterative creation, testing, and refinement of ideas. Devotees of these approaches adopt a “fail faster to succeed sooner” mantra. The gains in speed from the process changes that emphasize short sprints of creativity and effort and then a pause to gauge feedback and determine next steps offer the potential for teams and firms to move faster. They eliminate the inefficiencies and ambiguities surrounding long-form creation activities such as waterfall software development, where a series of long successive stages slow down the learning process. Encourage team members to experiment with small portions of big ideas. Try “chunking” ideas from big projects to allow individuals to learn more about the realities of solving the issue. Based on a series of smaller experiments, the team or individual will be better informed and able to tackle the larger initiative. Narrow your audience targeting and scope. While your idea might address a massive internal or external market, remember the phrase, “There are riches in niches.” Reduce the number of audiences you are striving to serve and focus on creating a solution or offering for a visible, well-defined group. Create a successful offering or program for one audience and then expand your reach based on the insights gained thus far. Encourage teams to focus on the work they can see in their headlights. The metaphor of a car’s headlights at nights is clear to everyone on the team. Focus on the work everyone can see in the next few weeks. While the big picture is out there and not completely invisible, the team’s efforts and focus must be clearly in the near-term work to be created that will enable it to move to the next phase. Focus on supporting your team by removing roadblocks. One of the most important roles of the manager is to clear the path of obstacles that tend to slow individuals and teams down on their journeys. Whether the impending issue focuses on human, financial or equipment resources, your job is to ensure they are in place and accessible at the right time. Coach teams, don’t cajole them. Observe your teams and employees and identify behaviors that either need to be strengthened or eliminated to improve performance. Use constructive and positive feedback liberally and always serve as a coach promoting performance and not a manager demanding compliance. Institute regular and timely lessons-learned sessions where you can build overall group knowledge on the insights gained from working on the initiative. Focus on “what worked” versus the more common, “what didn’t work” as a means of stimulating creativity. Celebrate successes and embrace failures. The tone you cultivate for lessons-learned through failures and the energy you create for successes will both support an environment free from fear and focused on striving for success. Timeliness is of the essence in our world of change. Adopt the behaviors of a high-performance manager and focus on enabling more efficient and stress-free performance and creativity and speed will follow. Have a Chronic Complainer at the Workplace? Here's how to deal.